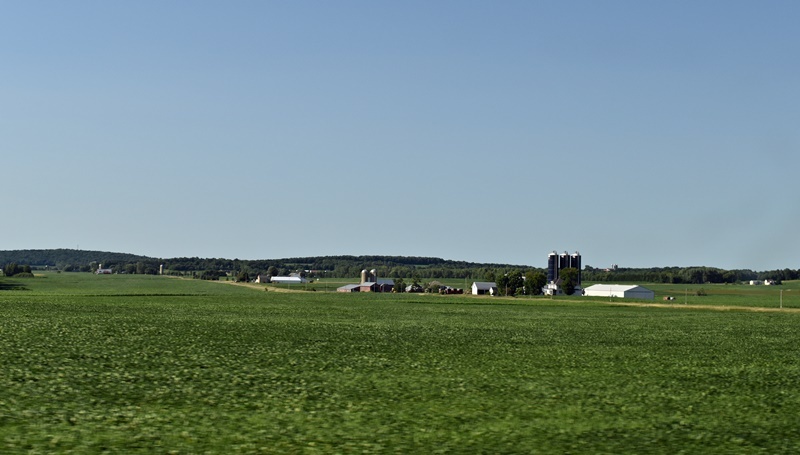 I took a road trip to Wisconsin with my two daughters and grandson for a family reunion in early July. We figured we hadn’t seen them in at least 15 years and thought we were overdue for a visit. My aunts are all getting older and I don’t want to wait until it’s too late to see them again. I have such great memories of summers spent with them and wanted my kids to get to know them a bit better as well. Why a road trip you ask? That’s the same question my daughter and son asked. “Why not fly, it’s faster”, “You’ll end up hating each other when you’re done.” These things may all be true but there is so much beauty to be seen here in the US and we never take the opportunity to enjoy it. Thousands, if not millions, of tourists each year come to the US to see sights we take for granted. 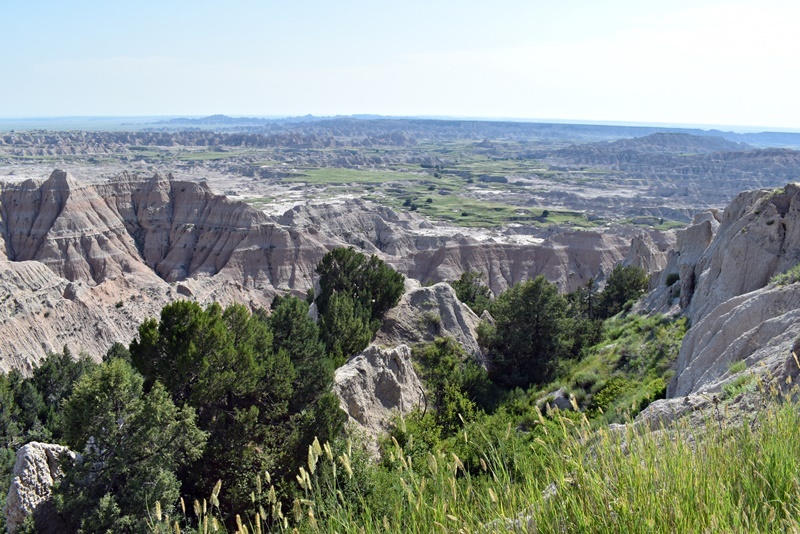 I wanted my grandson to be able see and learn about the different parts of the country as well. The reunion was casual and it was hilarious listening to my aunts telling stories about growing up. I’m really lucky they made it through childhood the way they tell it. Like the time one of my aunts had visited the circus and went home to “practice” the rope act and in the process almost strangled herself. Thank goodness my uncle was there to save the day. I really want to sit down with them all and write down all of their stories. It would be so sad to lose all of that history. We didn’t spend too much time in Wisconsin because we still had a long drive back and were going to let my grandson spend a night or two with his other grandparents in Sioux Falls, SD. We did spend a day pontooning around the lakes with a couple of my favorite cousins. It was beautiful weather and it made me miss Wisconsin in a small way. My grandson absolutely loved it, he’s such a water baby we had a hard time getting him out. 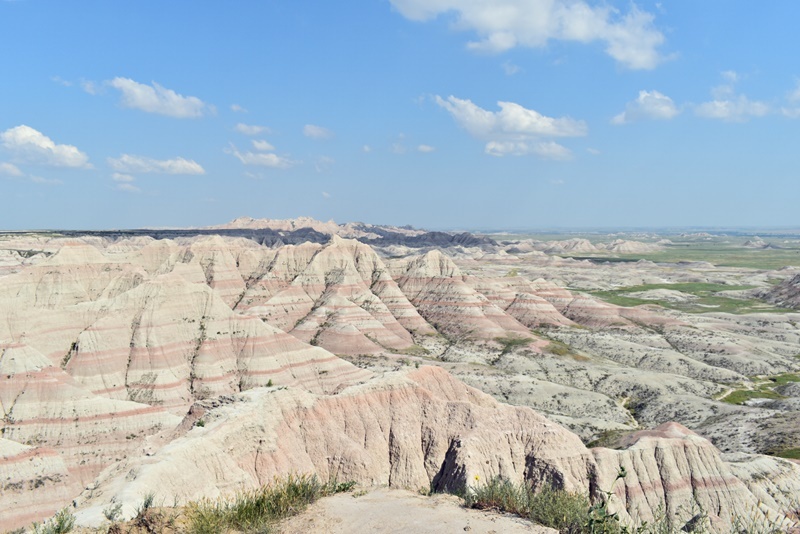 We ended up going through the Badlands again. The trip through last year was so fast and we didn’t really stop to climb around the rocks or anything. This time my grandson was allowed to climb to his hearts content. We made several stops to take pictures of the scenery along the way instead of my through the window pictures of last year. Just a more relaxing journey by far. 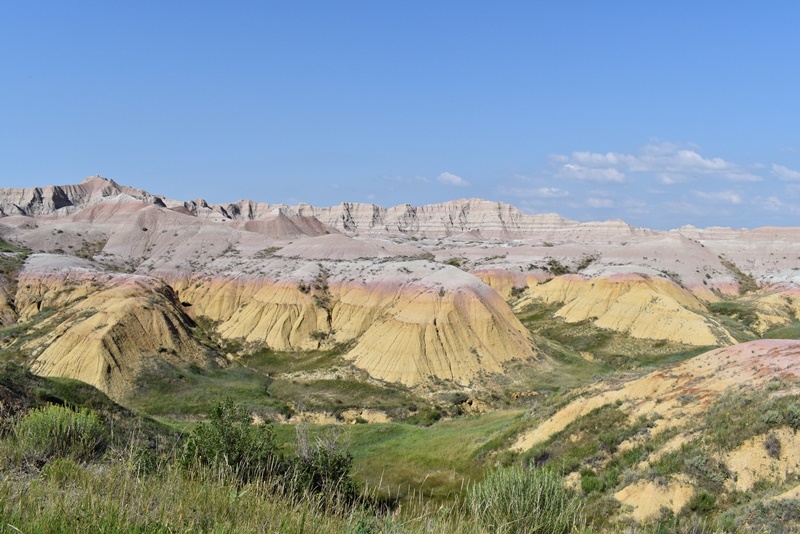 All the way from Sioux Falls to the Badlands we saw signs advertising Wall Drug. 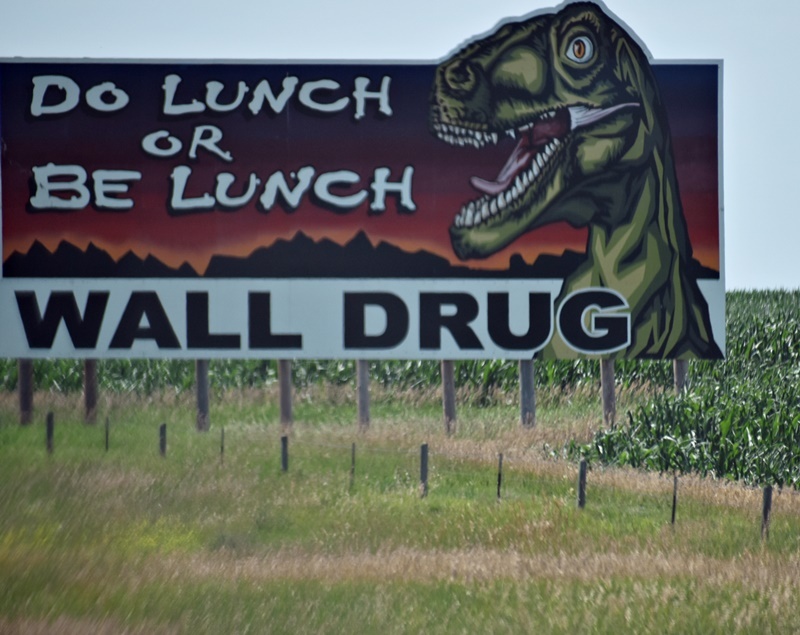 Of course if you visit the Badlands you have to stop at Wall Drug. Yeah, it’s touristy and gimmicky, but that’s what makes it fun. 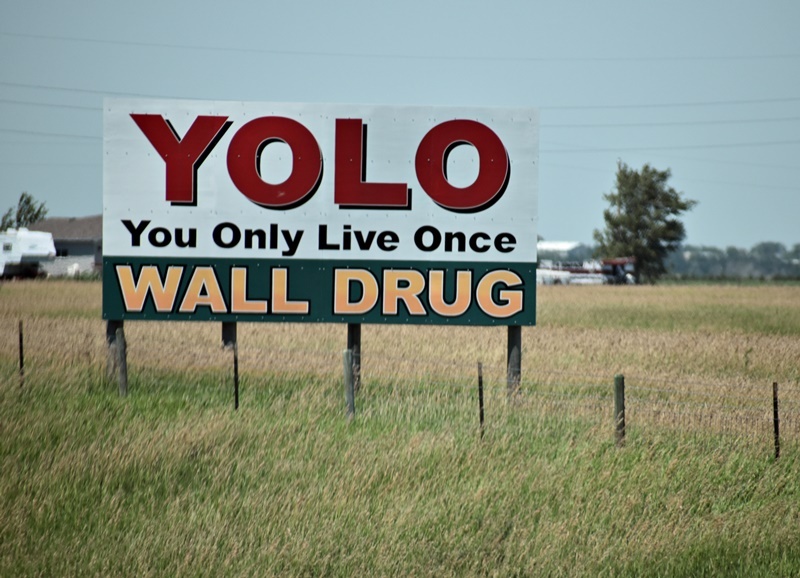 It’s a dinky, dusty little town thats only claim to fame is Wall Drug. Free ice water signs along the roadside got people to Wall originally and it’s been going strong ever since. It was definitely fun to watch for the signs and a great way to pass the time while driving along the long empty stretch of road. Waiting to see what the next fun sign would be kept us amused during the drive. 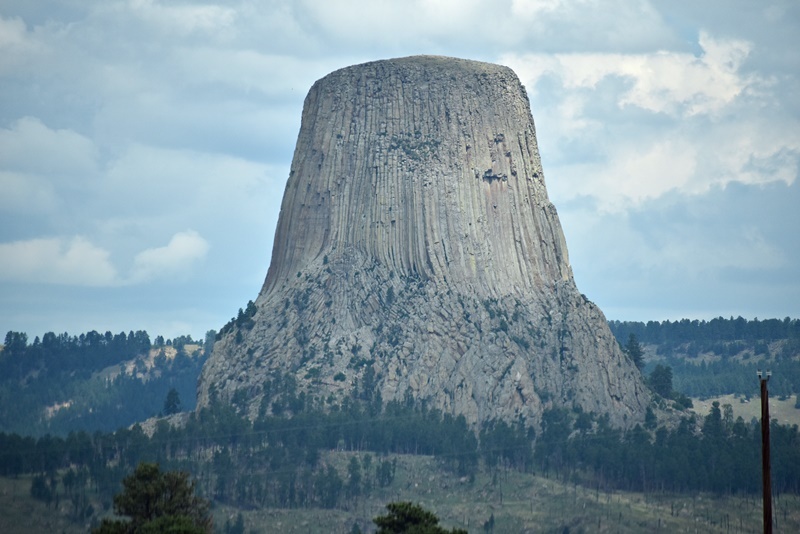 Our next stop would be Devils Tower in Wyoming. What a fantastic geographic marvel that was. You could see the tower from miles and miles away. It was fun watching it get bigger and bigger the closer you got. The road was long and winding but the scenery was gorgeous so it didn’t seem so bad. 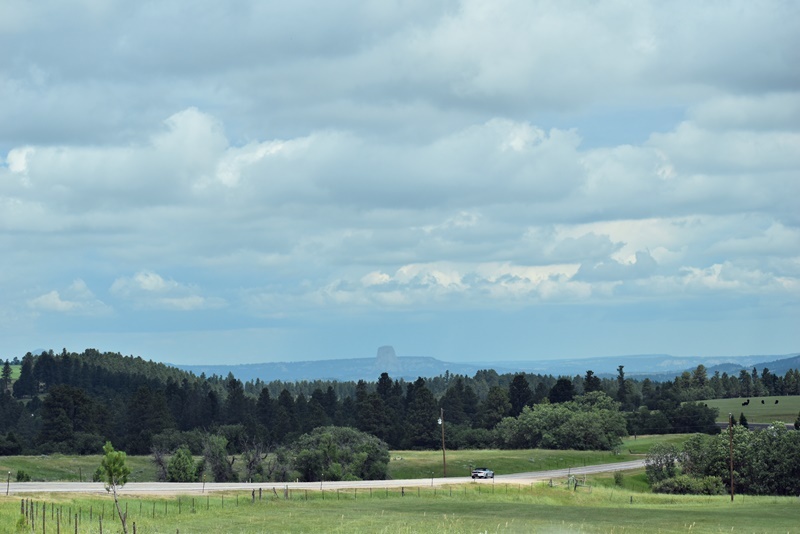 Devils Tower, WY – can you see it way in the distance? 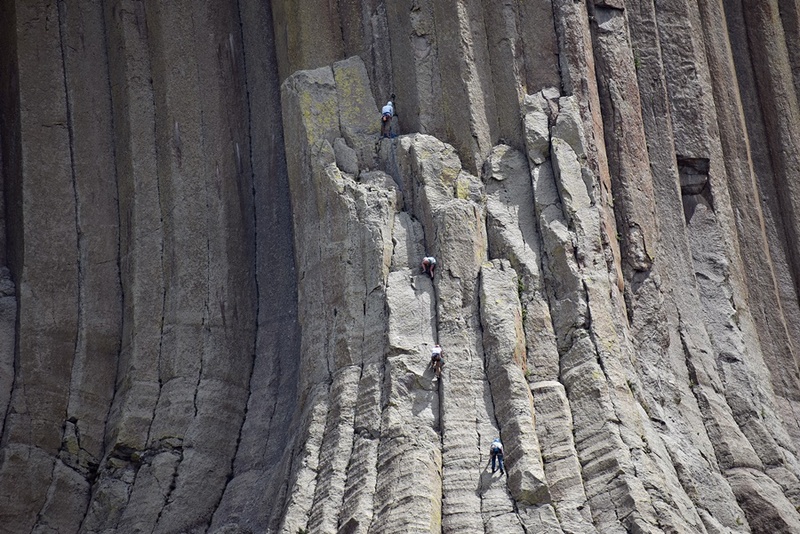 Devils Tower was established in 1906 as America’s first national monument by Theodore Roosevelt. 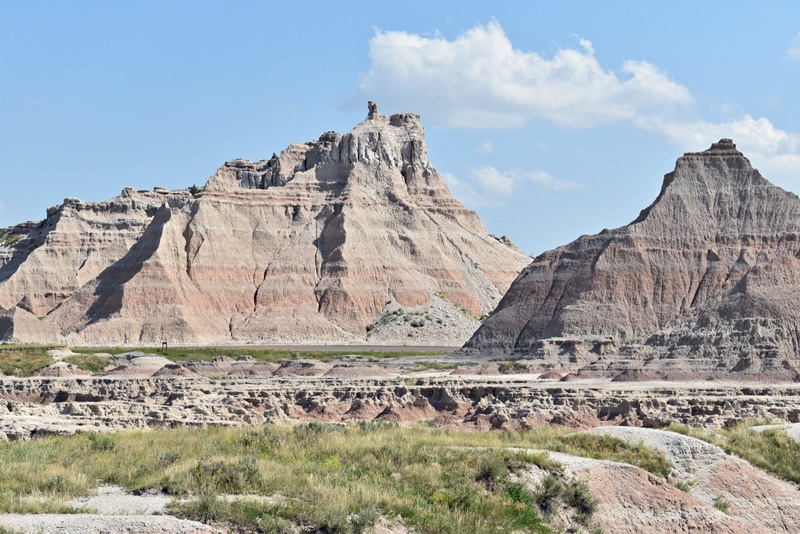 Geologists agree that the tower was formed by the forcible entry of magma into or between other rock formations, they just can’t agree upon how the process took place. No matter how it was formed it is totally interesting. The tower has these huge, long columns of rock that are just begging to be climbed. We saw several different sets of climbers starting to work their way up the sides. 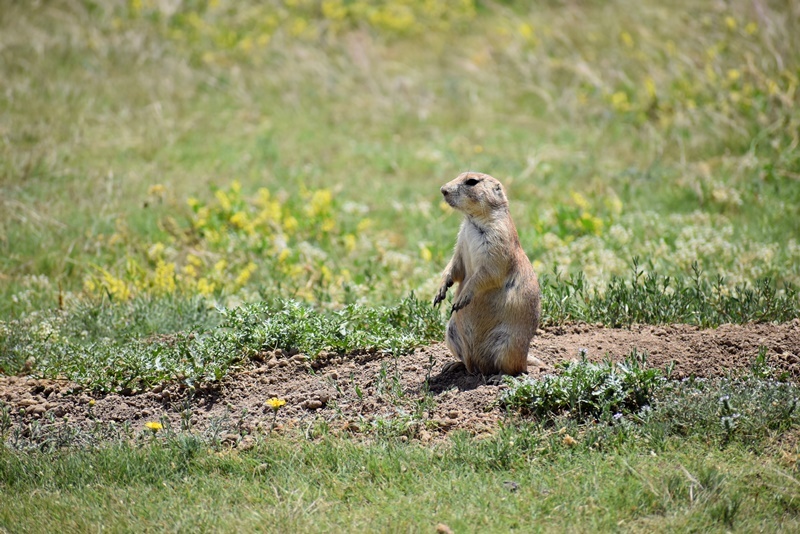 Of course this is the prairie and what can you expect to find but prairie dogs. 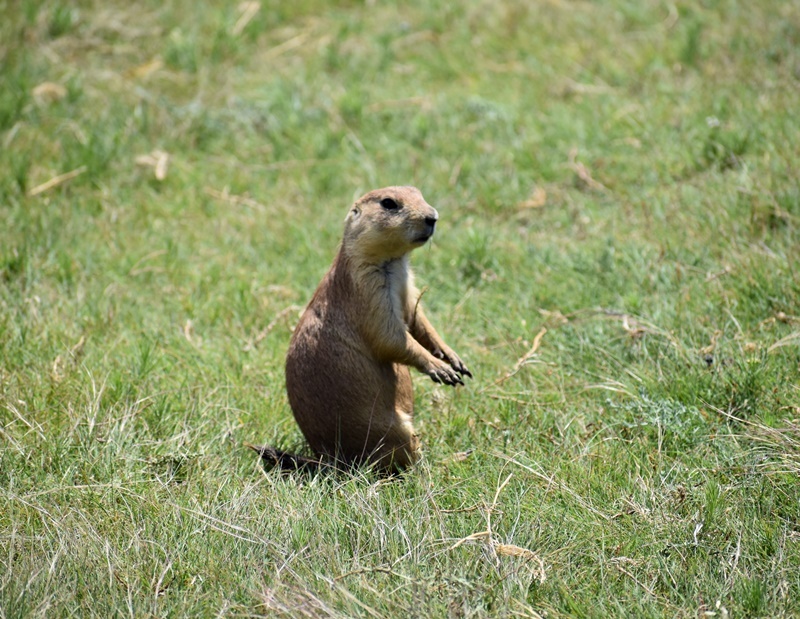 There were a few prairie dog towns very close to the road and we had to take advantage of the great photo op. Prairie dog doing it’s thing. Our little excursions took a little longer than we had anticipated so we had to scrap our other plans and get moving if we expected to be back in Washington by the weekend. This gave my grandson the time he wanted to explore and I wasn’t about to rush him through it. Now we have a reason to go back. I really wanted him to have a good and memorable experience and I think he did. Thorp WA – this is a must stop whenever we are on this side of the state. 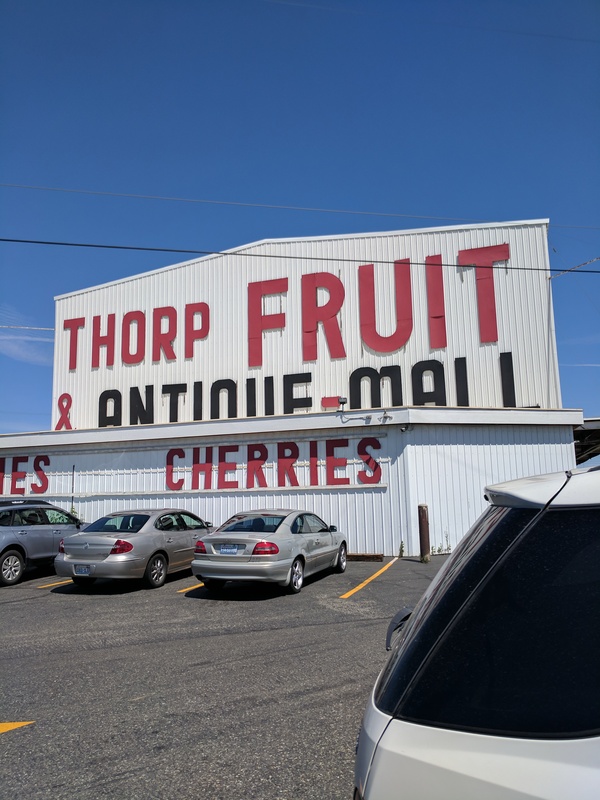 One other stop that is an absolute must when heading west from eastern Washington on I-90 is the Thorp Fruit stand. They have the freshest fruit and the best selection of locally made products like dressings, jams, wine, honey, etc. We couldn’t leave without a few jars of something and a bag of Rainier cherries. By the end of the trip we were glad to be home and off the road but at least we didn’t hate each other! End of year crochet finished projects round up.